Black Mesh Long Sleeve Top is rated 5.0 out of 5 by 3. 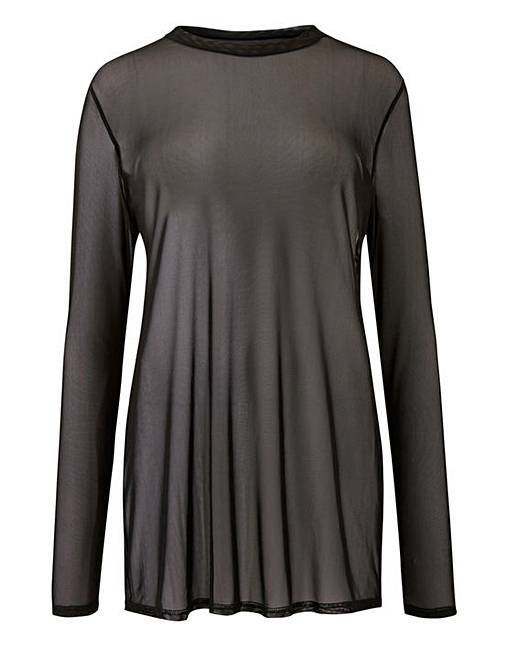 This long sleeve mesh top is the perfect wardrobe layering essential. It can easily be worn with your favourite bralet and barely there heels, for an effortless evening look. Or try pairing with a bandeau, checked shirt and chunky trainers for a casual yet stylish outfit. 30% of the purchase price will be donated to Breast Cancer Now, a working name of Breast Cancer Care and Breast Cancer Now, a registered charity (Nos 1160558, SC045584 and 1200). Fashion Targets Breast Cancer is Licensed by the Council of Fashion Designers of America, Inc./CFDA Foundation, Inc., U.S.A. Rated 5 out of 5 by Amcc from Very happy Bought the black one and also animal print. I'm a size 18/20 and was worried it would be tight and not stretchy. So I ordered one size 20 and one size 22. They are really nice and stretchy and quite giving. I probably could of fit nicely into and 18 depends how you want the fit to be. I'm keeping the 20 and exchanging the 22.